Three high profile ransomware attacks in only 2 months is certainly making news across the globe. And it’s clear from all the headlines there are plenty of easy targets whose IT Management are stuck in the ransomware cycle – Watch, Wince, Repeat. Silly, because these ransomware attacks are/were preventable from the start. In May, a fresh ransomware season was kicked off with WannaCry. Reaching more than 150 countries, and infecting more than 230,000 computers in 1 DAY! According to Wikipedia, it netted $130,634.77 as of 14 June, 2017. WannaCry targeted Windows systems, with Windows XP being hit the most. On June 10th, Korean web hosting company NAYANA was hit by the Erebus ransomware. It is notable because of the unprecedented demand for $4.4 million, which was negotiated down to $1 million. Ouch! 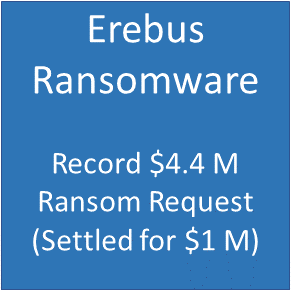 Erebus itself is a recycled ransomware originally attacking Windows systems in 2016. This time, it was reconfigured to attack Linux systems. And just in the last few days ago, the PetrWrap ransomware made a HUGE splash with a global campaign hitting airlines, banks, utilities, telecom, POS terminals, ATMS, and more throughout Europe, Russia, and Britain. This ransomware is a recycled WannaCry ransomware, and is intentionally using a massive global campaign to take advantage of systems still not properly protected against WannaCry. Quit living in the Watch, Wince, Repeat cycle, please contact us today at White Cloud Security because our patented next generation whitelisting technology stops future variants of ransomware attacks BY DEFAULT. No patching, updating, hunting, behavior analysis, or threat intelligence needed to maintain protection against current and future variants. This entry was posted in Ransomware and tagged Erebus, PetrWrap, Ransomware, WannaCry. Bookmark the permalink.